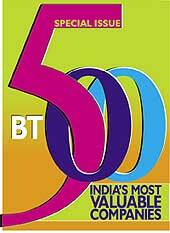 13 years after its creation, the higher echelons of the BT 500 now feature companies from sectors as varied as steel, automotive, banks, organized retail, biotech, pharmaceuticals, software, consumer products, media and entertainment, even two airlines. Now, it gets interesting. ONGC is leveraging its core competence to enter a host of other fields. The mission: straddle the entire oil value chain and extract every paise worth of value in it. Hindustan Lever is up against a big, driven and deep-pocketed new competitor, ITC. The market braces for action as the consumer market Goliaths prepare to lock horns. L&T and IVRCL have ridden the boom in the construction sector to scale greater heights. And they are both bullish about the road ahead. If Indian pharma's frontline leaders are not looking good, blame it as a short-term bottom line blip. With smart partnerships, strong product pipelines, the future isn't bleak. A ranking of the top 500 companies in India Inc.
A ranking of those companies that could not make it in the top 500 (501-1000). A. Dan Meiland, Executive Chairman, Egon Zehnder, speaks to BT on Indian operations and the future of the executive search industry. The impending slowdown in China will boost India's economy. But we'll still take years to catch up with our northern neighbour. Use index funds to soup up your portfolio. Don't mistake Wall Street for just a stock market. It's where, says a new book, America lives and dies every day. Enfield's Bullet turns 50 this year. A one-time Bullet-rider rides a new-age Bullet and realises that nothing has really changed. Focus on a still hungry Big Blue, and GE India. Tax-smart companies, an issue of ownership between SAB and Shaw Wallace and a media war in Chennai. Old economy companies are finding it tough to attract young engineers. Get acquainted first-hand with India's Massively Multi-player Online Role Playing Game.